Applications are invited from eligible candidates having UGC norms for the following posts of Jorhat College, Jorhat along with a Demand Draft for Rs. 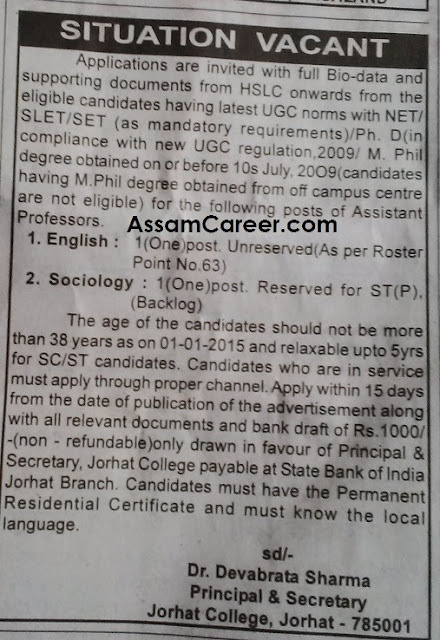 1000/- payable at SBI, Jorhat Branch, In favour of Principal & Secretary, Jorhat College within 15 days from the publication of this advertisement along with all testimonials, and Permanent Resident certificate. Age: Maximum age of the candidates 38 yrs as on 1.12.2015 and relaxable 5 yrs for ST/SC candidates.